The idea for this costume came from the 1995 Power Ranger movie. 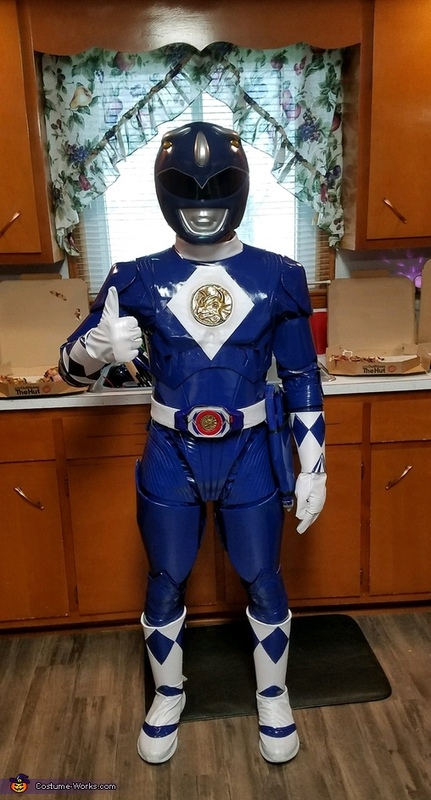 Growing up all I wanted to be was a Power Ranger, and this year I made that dream a reality. I'm wearing this costume. This is my first costume I've done myself (gloves sewn by my grandma). The suit is made from craft foam, thermoplastic and 4 way stretch fabric. Everything is handmade aside from the two medallions, shoe base, and the helmet. I drafted all patterns for the armor myself (with lots of trial and error). There's about 22 attached items on the suit itself. All pieces are attached with Velcro to the underlying body suit. The suit cost me about $210 and the helmet was $330, resulting in a total of about $540. I am by no means a professional, but I had a lot of fun (and stress) making this costume and I hope you like it! Are you open to commissions? I would really enjoy a red ranger suit from the movie. I don't need a helmet just the suit.